Cheese Effects provides 2 types of GIF services for your event, Animated GIF and Boomerang GIF booth. Both GIF services are of the same pricing and equally popular with many. There are minor differences in the operating procedure. Also, selection is mainly depends on the effects you would like for your event. Services are pre-determined and are not inter-changeable once finalized, so it is best to preview our samples before selecting the ideal one. The differences in both services are highlighted for your reference. Print will consist of the 3 photos taken. Photos will also be looped in this way for animated GIF. Outcome of the Animated GIF created using the 3 photos. Print (photo) and Boomerang GIF (video) are taken separately. Outcome of the Boomerang GIF created from a 5s video. 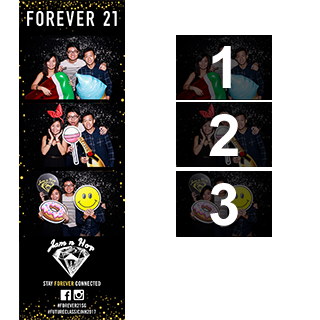 Photostrip - 6" x 2" 4R - 6" x 4"
In summary, Boomerang GIF requires a video-taking while Animated GIF (Standard) requires multiple photo-taking. Both GIF services are equally popular in Singapore. We advise you to choose base on your guests audience, preferred effect and event criteria.